Lauren Clem leaps to make a save. 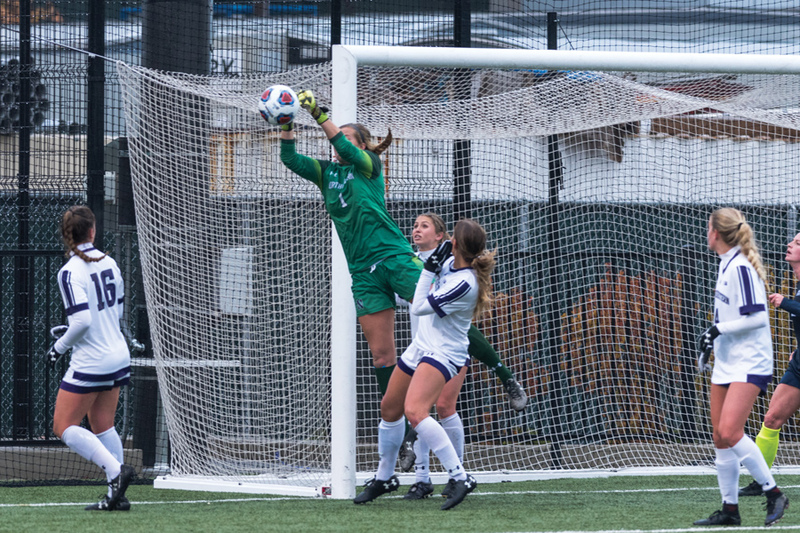 The senior goalkeeper saw her illustrious Northwestern career come to an end with a 1-0 loss at UCLA in the second round of the NCAA Tournament. Northwestern was 25 yards away from a miracle. Junior midfielder Marisa Viggiano set up for a free kick just outside No. 2 UCLA’s goal box and sent the ball at the net, toward nine of her teammates desperate to seal one of the biggest upsets in program history. There was less than a minute to play in regulation and the score was deadlocked at zero. But even with a golden opportunity — their only dangerous chance of the match — the Wildcats (12-8-3, 7-3-1 Big Ten) failed to convert. Two minutes later, the Bruins (17-2-2) scored in overtime and ended NU’s season in the second round of the NCAA Tournament. Even though UCLA outshot the Cats 26-2 in regulation, the Bruins were held scoreless until forward Anika Rodriguez’s golden goal snuck by a diving Lauren Clem. After the match, junior defender Hannah Davison said she realized how close NU was to completing the upset, but even though the Cats couldn’t close the door, she said their national perception has changed. NU’s seniors, whose careers ended Friday, have seen the program rise from the bottom of the Big Ten over the last four years. When the current seniors were freshmen, NU qualified for the conference tournament by beating Minnesota in its regular season finale, and the team was excited to enter postseason play for the first time under coach Michael Moynihan. The overtime victory over the Golden Gophers was the last time the Cats celebrated coming in eighth place. They haven’t missed an NCAA Tournament since. Clem had one of her best statistical performances against UCLA, which held possession for the majority of the match. Each of her career-high 12 saves came after a strong attempt from the talented Bruins attack, which entered the day sixth in the nation in goals per game. Davison said NU’s tenacity, unity and grit leveled the match despite the Bruins’ control of the game. Clem finishes her career ranked third in NCAA history with 48 shutouts, including 28 in her final two seasons. Other than Clem, NU will lose just one other consistent starter in defender Kassidy Gorman. The Cats will also lose two goal scorers, midfielders Maria Fayeulle and Grace Orndorff, who each scored once this season. The players responsible for more than 90 percent of NU’s goals will return, giving the program the talent to continue to progress. Though the Cats lack the international experience and highly-touted recruits UCLA claimed Friday night, Moynihan agreed with his players’ assessment of the program’s growth, especially after their effort in the last match of the season.